The train I get has come from Aberdare and makes up a regular fifteen minute interval service from Cardiff to Barry Island throughout the day. It leaves on time from platform 7 and is pretty full. We pull away out of the station and past the Millennium Dome on the right, crossing over the river Taff. We then turn off the South Wales mainline and go south west, passing Canton Depot on our right and then Cardiff City's new stadium. We then join up with a by pass line on the right from Radyr and move onto an embankment with terraced houses on the left below us and a park on the right. We then come into Grangetown station, which is an island platform station with a large looking dias for a shelter in the middle, plus several flower beds. On leaving, we pass a factory on the left, followed by the large blue Ikea warehouse and then a gasworks. Next we cross over the river Taff and pass under the A4160, passing more industrial units on the right. On the left is a large area of wasteland where there were once sidings. We then see several upmarket blocks of flats on the left with a marina next to it. The line to Penarth goes off to the left and soon after we arrive at Cogan station. It has two aluminium framed shelters, as well as a nice original cast iron bridge. We leave on an embankment, passing a playing field on the left and houses on the right. Then we go into a cutting, then a tunnel, then a cutting before emerging at Eastbrook. It is a modern looking station with two turquoise framed shelters. We pass modern houses on both sides of the track and then go onto an embankment. there are older houses now and then we come into Dinas Powys, which has two aluminium framed shelters. We go into a cutting and then onto an embankment. Soon there are fields on both sides as we leave Cardiff behind. The train has speeded up to about 40 mph and you can see across the Bristol Channel to the Mendip Hills beyond that. We go into another cutting and then curve sharply to the right, passing factory units on the left and houses on the right. A third track starts up on our left and runs parallel with us for the next few miles. There is a steel works on the left and then we arrive at Cadogan station, which has a red brick shelter on the left and a red brick station building on the right. As we leave you can see the remains of sidings on the left, with houses on the right. The third line on the left seems to move away from us and then turns off to the left into the docks area. We then come into Barry Docks station, which is an island platform station, with a large canopy over it. It has two aluminium framed shelters on the platform, though their roofs are missing! There is a large official looking building on the left just beyond the station, which could be the Dock Offices. The line then turns sharply to the right and we pass factory units on the left and office blocks on the right. A third line starts next to us on the left and runs parallel with us once more. There are to temporary looking platforms next to it about 200 yards apart. 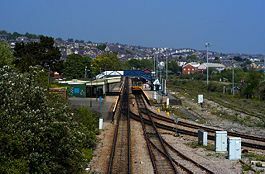 More sidings appear on the left and then a signal box appears on the left and we come into Barry station. There is an island platform on the left with an aluminium shelter and on the other platform is the main station building. It is modern looking with red bricks and turquoise paint. We leave Barry at 16.20 and turn left off the main line to Bridgend. We pass a semaphore signal and the double track merges into a single track. We are only doing 10 mph as we pass a large area of wasteland on the left (formerly Barry Island scrap yard). A second track then joins us on the left and we go onto a high bridge and over a river. We move onto an embankment and can see a car park on the left and a cricket field on the right. We then come into Barry Island station, which now has just the one platform in use, though there are remains of two island platforms. The station building is all shut up and there is no ticket machine even. The Barry Tourist Railway is just beyond the station further down the left hand track. At least thirty passengers, mostly day trippers are waiting to get onto the train.